There’s something a bit creepy about this. “I’m going to pray that [Tebow] is true to his faith because if he falls and gets caught up in some kind of scandal it will be bad for Christianity,” Brown said. The conventional wisdom is that a 2-loss team in the MNC game is a once-in-a-lifetime type event. But I believe this demonstrates a misunderstanding of the new math of the 12-game, conference championship era (especially with the Big East not having a dominant program anymore). He already fell. He joined the gators. I’m pretty sure today’s football king du jour is what Jesus was talking about when teaching His Disciples the Lord’s prayer. And, as much as I don’t like Florida, Tebow is an exceptional young man of character. I don’t think Mr. Brown has anything to worry about. Geesh. I pray for Tebow as well. He’ll need all the help he can get to keep Geno from eating him alive at the Cocktail Party behind that pitiful O-line. Not to get into a theological debate on this blog, but it would be wise of Eric Brown to remember that Tebow WILL sin at some point because he is human and not Jesus Christ. Mr. Brown should remember that we ought to let Jesus be the main focal point of the Gospel and not the star power of those who spread it. 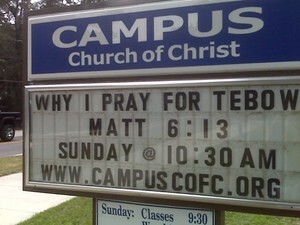 The Tebow worship is really getting out of hand from both a football and a Christian perspective. Not to hate on Tebow, but he isn’t the only devout Christian involved in college football. He just is the biggest name with the biggest program. Or maybe, the biggest name that the media loves with the biggest program that the media loves. I think it’s all blown a little out of proportion to be honest. As for Mr. Brown not having anything to worry about, I have friends at UF and have heard Tebow does pretty much everything any other college kid does. The only thing to worry about is whether or not the media falls out of love with the kid. My only beef with Tebow (other than him playing for UF) is that he jumps around doing jumping jacks after every 3-yard gain. If he played in the Pac-10, he’d be flagged 19 time a game. Oh my s^!t that’s the funniest thing I’ve read all day. Sounds to me like the Rev has heard some of the same nasty rumors about Tebow that I’ve heard. . . If we are getting Biblical, when I think of Tebow I remember Proverbs 16:7 “When a man’s ways are pleasing to the LORD, he makes even his enemies live at peace with him.” The same could be said for Richt.